According to Punch, Kim and the Managing Director, International Monetary Fund, Christine Lagarde, who spoke at separate press conferences in Washington DC, U.S, also advised Buhari to invest in things that would enhance economic growth. Kim said, “You know, in my very first meeting with President Buhari he said specifically that he would like us to shift our focus to the northern region of Nigeria and we’ve done that. Now, it has been very difficult. The work there has been very difficult. “I think Nigeria, of course, has suffered from the dropping oil prices. Investing in the things that will allow Nigeria to be a thriving, rapidly growing economy in the future is what the country has to focus on right now.” Kim also said, “Focusing on the northern part of Nigeria, we hope that as commodity prices stabilise and oil prices come back up, the economy will grow a bit more. 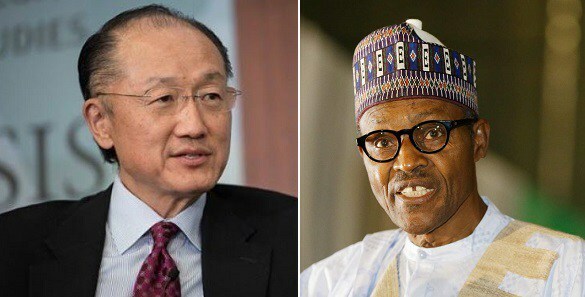 But very, very much important is the need to focus on what the drivers of growth in the future will be.” According to the World Bank boss, the bank will invest in human capital in other parts of Africa in order to prepare the continent for the next phase of growth.